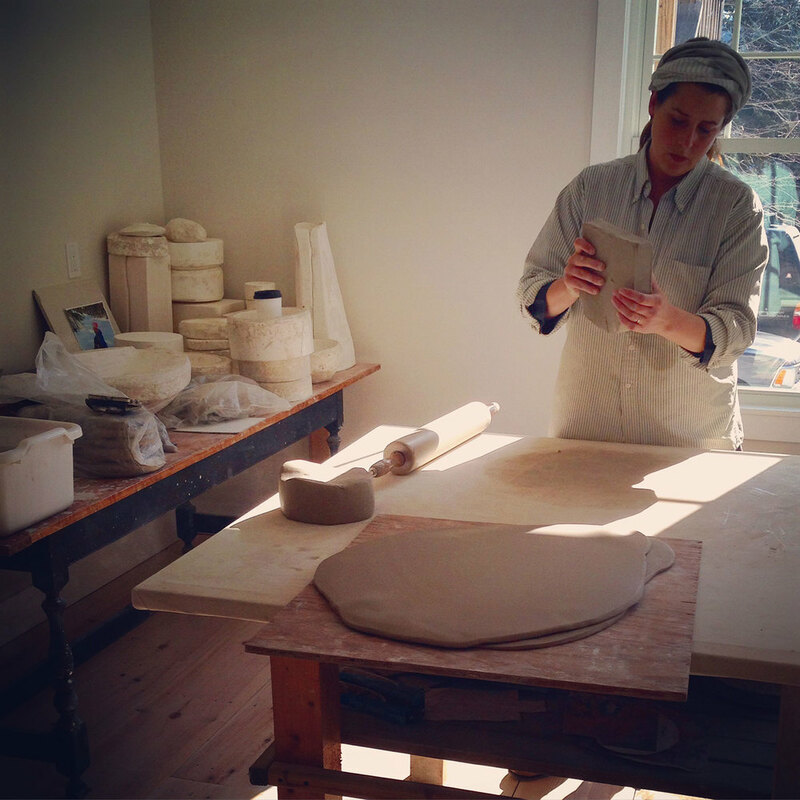 Making ceramics is a process best suited for those who are patient and willing to learn by error. Many people who visit our studio regale us with their own pottery stories of triumph or disaster. Everyone who has taken a class or spent time with the medium knows both ends of the spectrum. But those who dedicate their time and creative energies know the amount of labor and love invested. For those of you who don’t know much about the process, we aim to answer questions and give you some insight into our world. After Alison goes through the design process and prepares a model, she creates a variety of working molds depending on the form being cast/pressed. Our process begins in Boothbay Harbor with raw clay. We use a porcelain stoneware – grey in raw form, but cream colored after its final firing. The mugs and round Hugo’s plates are thrown on the wheel. All other pieces are made in a mold. We have three different mold techniques – the RAM press, slump molds, and slip casting. The RAM press is a mechanical hydraulic machine with changeable plaster molds in dies. To explain simply, we place a lump of raw clay between the top and bottom dies which are attached to the machine. We bring the two together, pressing the clay into the mold. 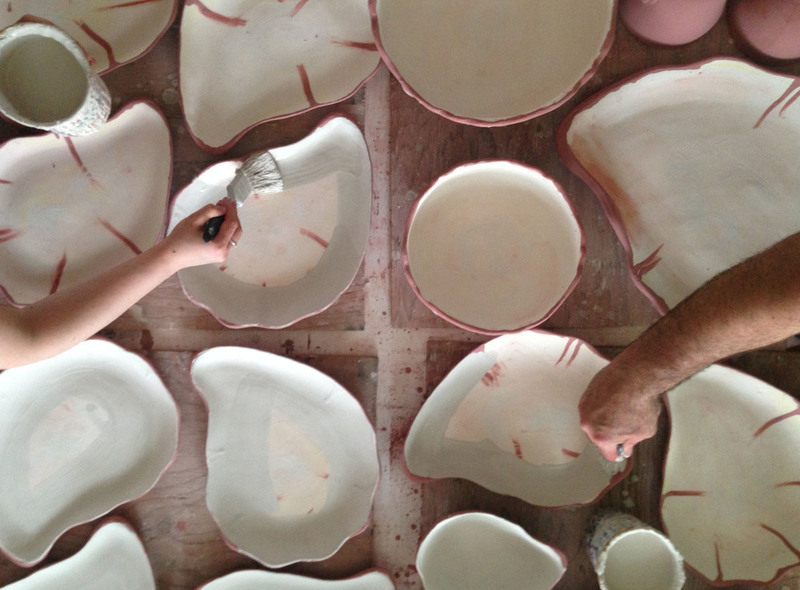 Once formed, we release the piece from the plaster, ideally producing a perfectly shaped bowl or plate. The pieces we make that are too large for the RAM press are made in a slump mold, hand formed by Alison herself. After rolling out a large slab she meticulously presses the clay into the mold. The plaster pulls moisture out of the clay. 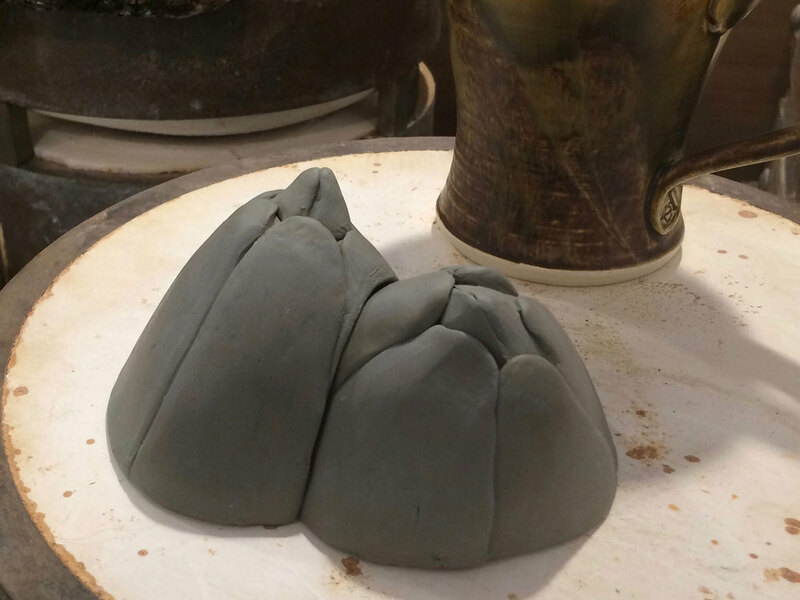 Once the clay has pulled away from the mold – depending on the size, hours or days later – it is ready to be removed. The final mold method we use is slip casting. Slip casting is used for the more intricate pieces – tea pots, cookie jars, and vases. Alison makes a slip (essentially a slurry of water, clay, and other minerals so that the clay becomes pourable) from our clay body. The slip is then poured into the mold and allowed to sit. During this time the water is pulled out of the slip that is touching the mold walls. The still wet inner slip is then poured out, creating the hollow interior of the piece. The edges are rounded and smoothed once the pieces have slowly dried enough to handle without altering or damaging the shape. 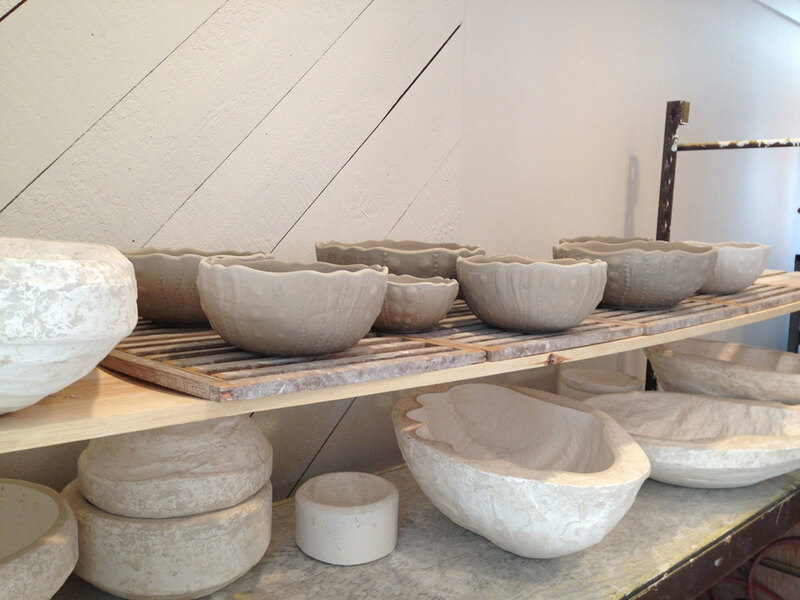 After the pieces have fully dried, they undergo their first firing, producing bisque-ware. The bisque-ware is transported to Yarmouth, where it is sanded to ensure smoothness, then waxed. 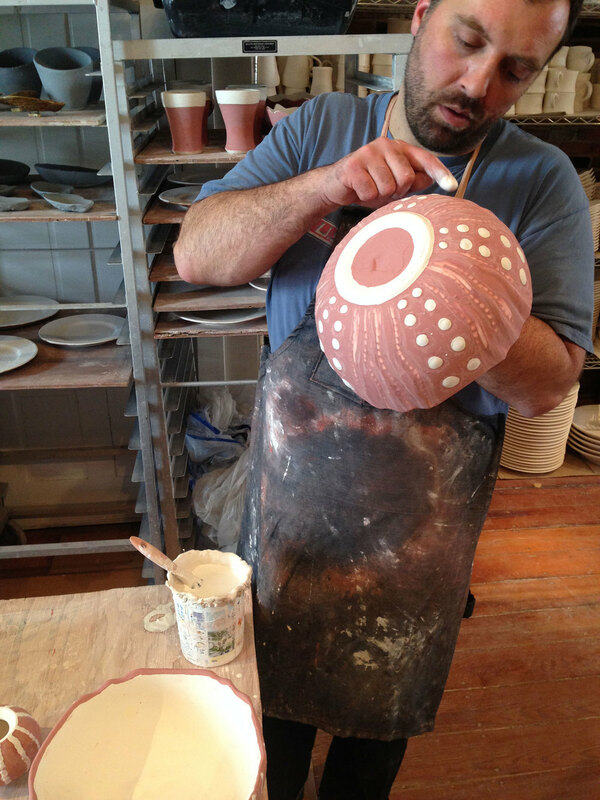 Because the wax resists glaze, we wax the base where each piece touches the surface of the kiln. Next, each piece is then hand glazed, each with a consistent pattern and method to enhance uniformity. Because bisque-ware is porous it absorbs the glaze, leaving a powdery surface of mixed metals, glass and clay particles behind. This combination of materials is called glaze and melts into the body of the clay when fired in the kiln. The interior of our pieces (except Porcelain White and Slate) are hand painted with a crystalline glaze. Due to the fickle nature of crystalline glazes, each piece comes out unique. There are many different factors altering the outcome: some occur during the glazing process, like the thickness of application, while others occur during the final glaze fire, like age of the kiln’s heating elements. We do our best to control as many factors as possible to produce consistent outcomes, but we are at the mercy of the kiln gods. Instead of fighting, we have learned to love and value the uniqueness of each piece, telling their story of their own creation. During their final glaze fire the pieces are brought up to around 2300°F, where the glaze gets hot enough to essentially melt, forming a glasslike surface. Once cool, we remove the pottery, grind the bottoms to flatten any irregularities, disperse to fill orders, and finally ship. Shipping may seem like one of the easier phases in our process, but due to the delicate nature of ceramics we spend a lot of time and resources to ensure they get to their destination unharmed. More often than we like, a piece will develop a flaw at one stage in the process – a crack, glaze that is too thick or thin, warped edges, over or under crystallized glaze. Although it is heartbreaking to us, we have many fans of these “flawed” pieces - people who happily give them a home, adding them to their collections. We call these pieces Seconds and sell them at discounted prices (depending on the flaw).